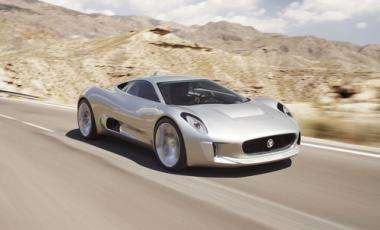 (PhysOrg.com) -- The new Jaguar C-X75 supercar concept model unveiled last week is primarily a plug-in electric car but with the added power and performance of micro gas turbines (jet engines) that would make it the fastest electric car on the road. An electric motor on each wheel delivers 145 kW from a single floor-mounted lithium ion battery pack that gives the car a range of up to 110 km on electric power alone. When the battery runs down it can be recharged in six hours from a normal household mains outlet. 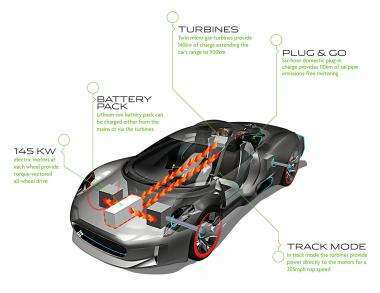 The Jaguar C-X75 (named for Jaguar’s 75th anniversary) has another option that other electric cars do not offer, which is a boost by two 70 kW micro gas turbines running on a choice of natural gas, liquefied petroleum gas, diesel or biofuels, mixed with air. The micro gas turbines spin at 80,000 rpm and can power the electric motors directly (increasing the power) or can be used to recharge the battery (increasing the range). The micro gas turbines are extremely small and relatively cheap to manufacture. They can run at a fixed, most efficient RPM to recharge the batteries, and provide high performance and efficiency but with low emissions and low maintenance costs. Despite being a type of jet engine, the micro gas turbines are said to be low noise and produce no vibration. Jaguar claims the two-seater car will be able to reach 100 km/h (62 mph) in 3.4 seconds, and will have a top speed of 330 km/h (205 mph) when the batteries and turbines are working together. The all-wheel drive produces a torque of 1,600 Nm (1,180 lb-ft). The gas turbines extend the maximum range to 900 km (560 miles), with carbon emissions of only 28 g/km with the turbines running. The Jaguar C-X75, which was unveiled last week at the 2010 Paris motor show, is at the concept stage and may never be produced, but even if it is never marketed, elements of the design could find their way into future Jaguar cars. It would seem that this is the future - Having a small, efficient motor provide electrical power to an electric motor that does the work. 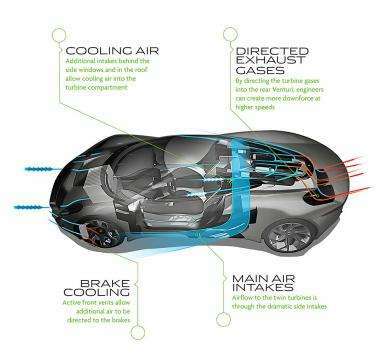 Even if that the engine is gas based, it would be much quieter, produce less emissions, run at a consistent RPM, etc. Its like driving an electric car with a gas generator in the trunk. Lets do it! WIN WIN! 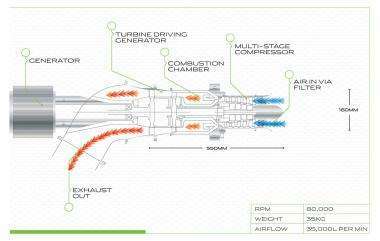 have any of you played with micro jet engines (model airplanes)? huge fire risk and its not as confined as the "explosions" in your piston block! Certainly thrashes the Ford model's range and charge time. 6 hours charge vs 14 hours charge. QC - the charge time is using an EU 220 volt/20 amp outlet vs a 120v/15 amp outlet for the Ford. fixer - a solar panel large enough to power a car is about the size of a semi trailer. Check the Au. Solar Race vehicles for reference. Those efficient microturbines could power your house, and sell electricity to the grid through inverters. I want to see more cars using these turbines. I'm starting to remember just how much more efficient the turbines are compared to piston engines, there's a very good reason why their much bigger cousins are used on airplanes today. What's the suction like at the intakes? I wonder how they prevent FOD (foreign object damage) to the micro turbines. I could imagine the smallest bit of gravel getting sucked into the intake and shredding the turbine. Nothing like sharing the shrapnel with your fellow motorists. Add a speaker system with sound effect - Problem solved! A great car with a good charge time that with further development could mean a commercial car that may be affordable - i hope! This is a similar technique as used by diesel electric train engines - which have been out since the 1940's. Here in the States a company called CSX advertizes that they can move a ton of freight nearly 500 miles on a gallon of fuel. These are just some changes in the way the technique is applied. Specifically with the introduction of the battery. For normal operation the vast majority of an engine's power is not used. Using a more effecient engine design to maintain a charge on a battery bank - or to lend boost power for passing or climbing steep grades just makes good sense. I like to see this type of research and engineering, but what I really want to see is for someone to start mass marketing this. It's time already.. It's not the first turbine hybrid car! A little fiddling with the exhaust system on those turbos and I'll bet you could get a bichen whine that would put a v8's roar to shame! Just imagine cranking them up while waiting at the light, they hit 80 grand, the light turns green and all four tires are smokin! I assume the turbine diagrams are just concept drawings, because they lack a regenerator (waste heat recycler), because a straight through microturbine isn't exactly very efficient. The regenerator was one of the failure points of the Chrysler turbine car in the 60's because they couldn't figure out a way to mass-manufacture one cheaply. Cool but you'll notice it doesn't mention the mileage when the turbines are running, a critical piece of info. Whether the turbines power the motors directly or indirectly by charging the battery it's the same. The fact that they can drive the motors directly with more power than the battery can supply (200+ mph) sounds like efficiency is sacrificed for power. How well this works depends on how efficient the turbines are compared to similar designs that use other types of engines. The basic elements of this 'concept car' were available more than a century ago. So, how modern are our ice-cars anyway? Ice-age modern that is, consumers have been ripped-off for so long. This obvious concept could have been developed/refined during the last 100 years into the super-efficient modern cars we don't have now. A small society of crooks determine our lifes, that is what this concept proves.